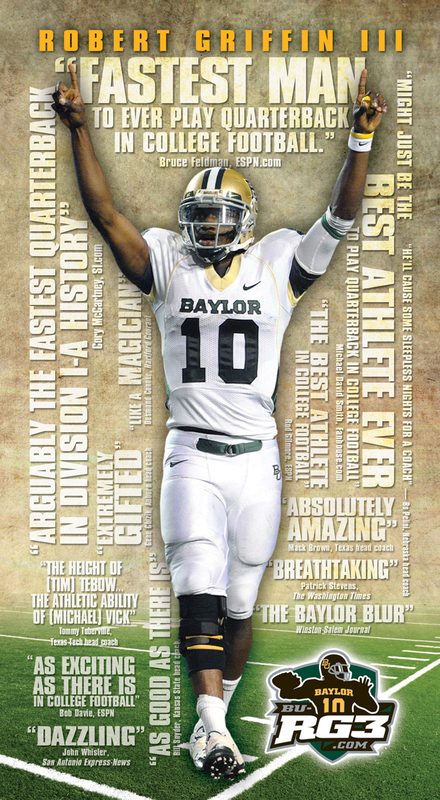 During the fall of 2011, Schaffhauser Design was honored to work with Baylor University in the Heisman promotion of Robert Griffin III (RG3). Working with Baylor's Assistant AD, Heath Nielsen, we put together a unique approach over the course of the season to spread the word to media voters of this phenomenal student-athlete. "Convinced that universities were moving away from traditional Heisman “campaigns,” Baylor opted to take a subtle, “less is more” approach. Instead of flashy high-priced advertising and traditional weekly mailers, they settled on an RGIII trading card set that were sent to media/Heisman voters throughout the season. In addition to the trading cards, Baylor also created a website, put out weekly videos, and embraced Facebook and Twitter as platforms that could get the word out. They created a “Join the Third” movement on Facebook and Twitter where they asked fans to add a “III” at the end of their name or a #JoinTheThird hashtag and post a declaration of support for RGIII and found that quite a few non Baylor fans even joined in to support RGIII." Dec. 10, 2012. Griffin’s college football career culminated into this decisive moment, elegantly clad among his competitors in New York City’s Sports Museum of America.